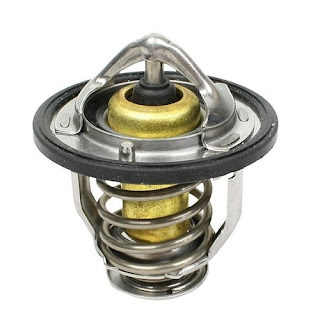 A car thermostat maintains the flow of coolant through the engine and plays an extremely vital role in the operation of your vehicle's engine.When the engine has been sitting for a while and is not hot, the thermostat will be closed. Once the engine is running and reaches a certain operating temperature, a sensor located inside the thermostat opens it, allowing the coolant to flow to and from the radiator, which decreases the temperature and allows to circulate it again in the engine. This constant flow (combined with several other components of the cooling system) allows your vehicle's engine to operate at the optimum temperature. Opening and closing the thermostat at the right time is essential to maintain proper motor temperature. In the event of the thermostat stopping, there would be no way for the coolant to circulate in the radiator and eventually return to the engine, resulting in extremely high temperatures. Similarly, if the thermostat is "blocked" in opening, the coolant flow is constant, the temperature of the engine of the vehicle never reaching an optimal level of heat, which creates problems of performances and accelerates the wear pieces. it is a heat sensitive control device located in the radiator hose. When the engine temperature reaches normal operating temperature, this unit must be opened to allow coolant to flow into the engine to regulate heat. If the thermostat is closed, the antifreeze will not come out of the radiator, which will cause the car to overheat. Therefore, if this happens, one of the possible causes is a broken thermostat. This problem can certainly be attributed to other problems related to the cooling system, such as pipe leaks, but the verification of a faulty thermostat should also be on your list because it is a relatively simple solution and inexpensive. If the thermostat is stuck in an open setting, the motor is under heating. The open setting means that the coolant will enter the engine constantly, whether it is hot enough or not. Instead of being too hot all the time, the engine will have the problem of being too cold. If you've been driving for a few minutes and your vehicle's temperature gauge needle is still near the bottom, it's time to check your thermostat. A defective thermostat would cause unusual temperature fluctuations during engine operation. In this case, the thermostat will not lock in a given position, but there will always be false readings that cause regulation problems. The engine temperature will change irregularly while the radiator coolant will not flow normally. If the operating temperature of the motor is ubiquitous when trying to operate, the performance of the motor will eventually suffer. This could result in a reduction in fuel consumption and, possibly, damage that would be costly to repair. If you notice any of these problems, feel free to open the hood and check your car's thermostat. You can buy a new thermostat at your local auto parts store. The repair is simple and can be done on your own if you want to save money.